A study in Tehran in 2013 by Bahadori et al. showed that cost, inconvenience, fear, organization, and patient-dentist relationship were determined as barriers to access dental services, among which the cost and patient-dentist relationship were identified as the first and last priorities  whereas in India, Nandhini et al. found that unpleasant experiences and factors of appreciation and laziness were the self-reported barriers to regular dental care. Jain et al. in Virajpet, reported that barriers for utilization of oral health care were knowledge, attitude, fear, cost, and transport. Thus, these barriers to access dental care have been shown to vary from region to region. The previous studies have utilized the questionnaire to assess the barriers in utilization, which had certain methodological issues. To address this issue, we used decision-making trial and evaluation laboratory (DEMATEL) method to assess the perceived barriers in accessing of dental care in Modinagar, Uttar Pradesh. The study was conducted in Modinagar, which is located in Western part of Uttar Pradesh India. A cross-sectional survey was carried out among the patients attending the outpatient section of the dental institute during the month of February in the year 2014. A total of 385 subjects were selected for the study along the basis of convenient judgment sampling. The patients who were above 15 years of age for better comprehension and understanding were included. Ethical approval was received from the institutional review board, and informed consent was obtained from all the study participants. Participation in the study was voluntary and confidentiality of data was maintained. The questionnaire was constructed by two-step approach. The first part included the patients' demographic data and the second one included the barriers. A 5-point scale was used to assess the determinants. When the barriers were identified, another questionnaire was designed using the categorized barriers and sent to 10 experts specializing in dental care. This questionnaire had five closed questions and one open question regarding the identified barriers. The closed questions were rated using a 5-point Likert scale. The open question was designed so that they were able to express their viewpoints on the mentioned determinants [Table 1]. The questionnaire was pretested by conducting a pilot study on 73 patients who comprised 20% of the study sample. Reliability of the questionnaire was assessed using Test-Retest and the values of measured kappa (k) were 0.86 and weighted kappa (k) was 0.9. Internal consistency of the questionnaire was assessed by applying chronbach's-alpha (ᾳ) and the value of ᾳ = 0. 78 was obtained. Criterion and construct validity of the questionnaire was assured by using Spearman's correlation coefficient (P < 0.001). The construct validity was calculated for each construct/parameter including cost, fear, inconvenience, organization, and patient-provider relation by calculating Spearman correlation between individual items for the particular construct and overall score of that construct. The collected data were analyzed using statistical package for social sciences (SPSS) version 18.0 (SPSS Inc., Chicago, IL, USA) and MATLAB 7.6.0 (Mathworks, 1970, Simulink and Stateflow). Results were summarized by descriptive as well as analytical tests, including mean, standard deviation, and one-way ANOVA and DEMATEL. The questionnaire-based study was carried out among the 385 subjects regarding the perceived barriers to the dental health care. The total of 364 subjects responded to the questionnaire, generating the response rate of 94.5%. 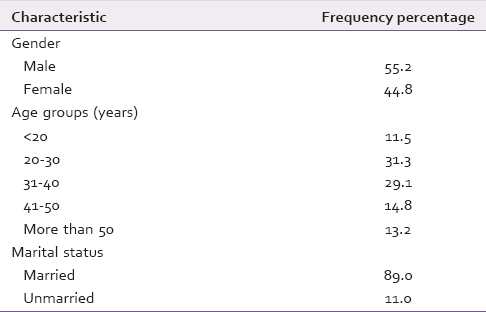 The study sample comprised 201 (55.2%) males and 163 (44.8%) females and the most of them (31.3%) were in the 20-30 age groups [Table 2]. 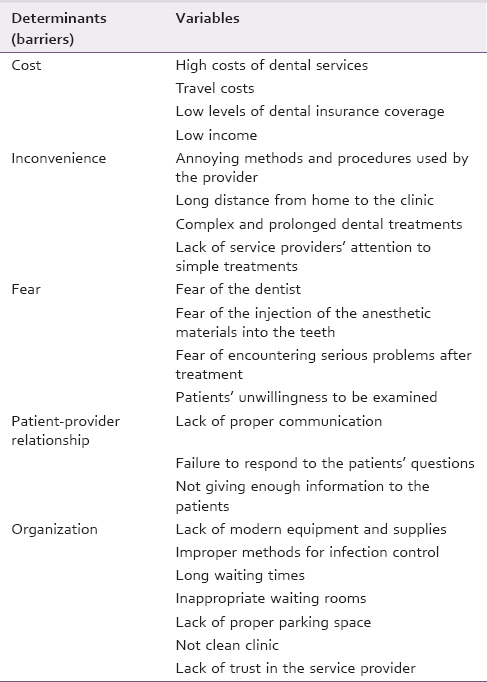 Based on the subject's responses to the questionnaire, the five factors cost, fear, organization, inconvenience, and relationship were identified as the key factors affecting the utilization of dental health services. Based on analysis of the responses of the subjects on the Likert scale, the cost (54.75% agreed or strongly agreed) was identified as the most important factor affecting the access to dental health care followed by dentist-patient relationship (48.57%), inconvenience (36.55%), fear (23.70%), and organization (14.02%). The difference was found to be statistically significant (P = 0.0001) [Table 3]. The factors identified by patients responses were further analyzed using DEMATEL method, based on the viewpoints of the 10 (out of which five responded) subject experts on the Perceived Access Barriers to the Dental Services. All the experts who responded agreed with the proposed barriers affecting access to dental services [Table 4]. 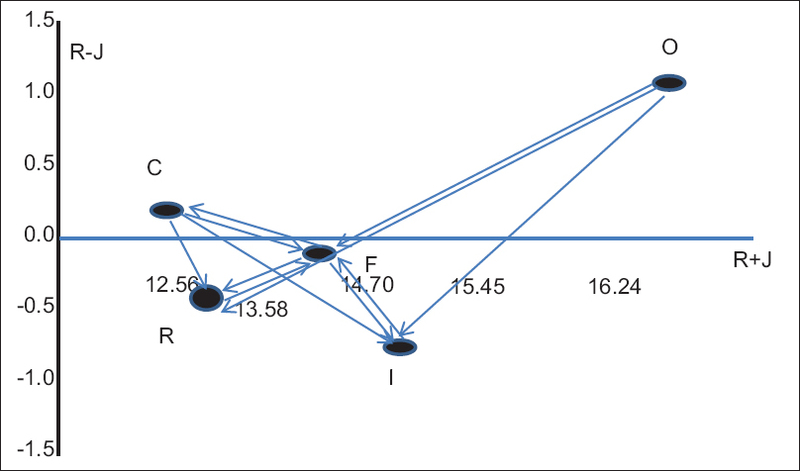 When the hierarchy of the affecting and affected factors was calculated based on the factor analysis, the results showed that the cost (R−J = 0.16) and organization (R−J = 1.15), were certain affecting determinant which influenced the access to dental services and inconvenience, fear, and the patient-dentist relationship were affected factors and did not influenced the utilization of dental health services [Table 5] and [Figure 2]. In our work, we have established the five determinants including cost, fear, inconvenience, patient-provider relationship, and organization for dental services, systematically to achieve a greater apprehension of these determinants. Based on subject responses to the questions and analysis of the expert's viewpoints by DEMATEL method, the cost was identified as the most important access factor of dental service utilization. The study findings are in agreement with the findings of Bahadori et al. who identified cost as an affecting determinant of dental service utilization on the first priority basis. Curtis et al. in their study examined some of the barriers to access to dental services and concluded that the direct and indirect costs such as travel costs in remote areas had effect on access to dental care and was considered as an important barrier. Among Canadian adults, travel costs and having a low income had been considered as two access barriers. The results of a study  conducted in India showed that the cost and the felt need influenced the number of dental visits. In India, where the majority of dental services are provided by the private practitioners, and there is limited availability and access to affordable dental care, the cost can be considered as the most important factor affecting the access and utilization of dental health services. The other less important factors that were identified in the present study include dentist - patient relationship, fear, and inconvenience. The effective and appropriate dentist-patient relationship is necessary for increasing confidence of the patient in dentist and thus influences the health seeking behavior of the patient. The results of Mohammad Pour's study showed that 22% of people had not referred to the physician in a health center because of the lack of confidence in him/her. Al-Shammari et al. in a study in Kuwait concluded that fear, bad habits, and false beliefs were the major access barriers. The results of Patouillard et al. concluded that fear has a direct relationship with not referring to the dentist, which are not in agreement with the present study, where fear is the one of the components which took the last priorities. The present study comprehensively assessed the barriers to the utilization of dental health services using the DEMATEL method based on expert's viewpoints. The DEMATEL method is a methodology, which can confirm interdependence among variables and reflect the interrelationships between variables, and can be used for researching and solving complicated and intertwined problem groups. 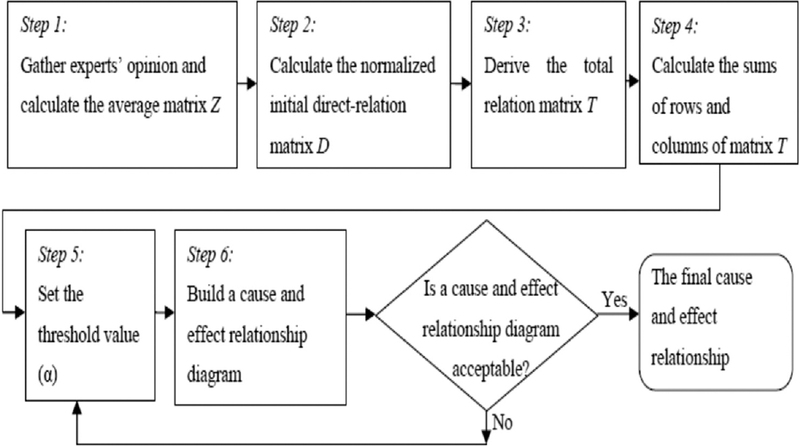 Thus, the uses of DEMATEL method strengthen the study by determining the causal relationships between the determinants. However in this study, only the determinants were studied; the variables associated with each determinant were not reviewed because of patients' fatigue and tiredness and, therefore, can lead to lowered patients' accuracy in their responses to some extent. The results of this study supported the idea that in order to motivate people successfully, one has to pay attention to the individual reasons, which restrict their behavior. Since the people's conditions and characteristics affect their access to health services, the policies on distribution of health services for the population should be fair and equitable. Preserving, restoring, and promoting the public health are the goals of healthcare providers, and one of the major issues in social welfare is the equitable provision of health services to the population. Identifying perceived access barriers to dental services is one of the basic steps to improve the public health. However, within the limits of the present study, it can be concluded that the highly reported barriers for utilization of oral health care were: Fear, cost, and organization. Ajayi DM, Arigbede AO. Barriers to oral health care utilization in Ibadan, South West Nigeria. Afr Health Sci 2012;12:507-13. Bahadori M, Ravangard R, Asghari B. Perceived barriers affecting access to preventive dental services: Application of DEMATEL method. Iran Red Crescent Med J 2013;15:655-62. Armfield J. The avoidance and delaying of dental visits in Australia. Aust Dent J 2012;57:243-7. Freeman R. Barriers to accessing and accepting dental care. Br Dent J 1999;187:81-4. Nandhini L, Barani K, Prabhu D, Manipal S, Ahmed A, Adusumilli A. Self-reported barriers to regular dental care in Chennai, Tamil Nadu. J Orofac Res 2013;3:161-5. Jain VK, Sequeira P, Jain J, Chancy U, Maliyil MJ, Bhagwandas SC. Barriers in utilization of oral health care services among patients attending primary and community health centres in Virajpet, South Karnataka. Natl J Med Dent Res 2013;1:33-41. Li CW, Tzeng GH. Identification of a threshold value for the DEMATEL method using the maximum mean de-entropy algorithm to find critical services provided by a semiconductor intellectual property mall. Expert Syst Appl 2009;36:9891-8. Curtis B, Evans RW, Sbaraini A, Schwarz E. Geographic location and indirect costs as a barrier to dental treatment: A patient perspective. Aust Dent J 2007;52:271-5. Locker D, Maggirias J, Quiñonez C. Income, dental insurance coverage, and financial barriers to dental care among Canadian adults. J Public Health Dent 2011;71:327-34. Kakatkar G, Bhat N, Nagarajappa R, Prasad V, Sharda A, Asawa K, et al. Barriers to the utilization of dental services in udaipur, India. J Dent (Tehran) 2011;8:81-9. Telleen S, Rhee Kim YO, Chavez N, Barrett RE, Hall W, Gajendra S. Access to oral health services for urban low-income Latino children: Social ecological influences. J Public Health Dent 2012;72:8-18. Sharifzadegan MH, Mamdohi MR, Lavi M. AP-median-model-based analysis of spatial inequality in accessibility to public health care intended for urban health development in Isfahan city. Soc Welfare Q 2010;10:265-85. Wu CR, Lin CT, Chen HC. Optimal selection of location for Taiwanese hospitals to ensure a competitive advantage by using the analytic hierarchy process and sensitivity analysis. Build Environ 2007;42:1431-44. Mohammad PA, Motallebi M, Khajavi A, Bazeli J. The quality of receiving medical services in the society by people and the factors that impact on it. J Gonabad Univ Med Sci 2002;8:23-7. Al-Shammari KF, Al-Ansari JM, Al-Khabbaz AK, Honkala S. Barriers to seeking preventive dental care by Kuwaiti adults. Med Princ Pract 2007;16:413-9. Patouillard E, Goodman CA, Hanson KG, Mills AJ. Can working with the private for-profit sector improve utilization of quality health services by the poor? A systematic review of the literature. Int J Equity Health 2007;6:17.